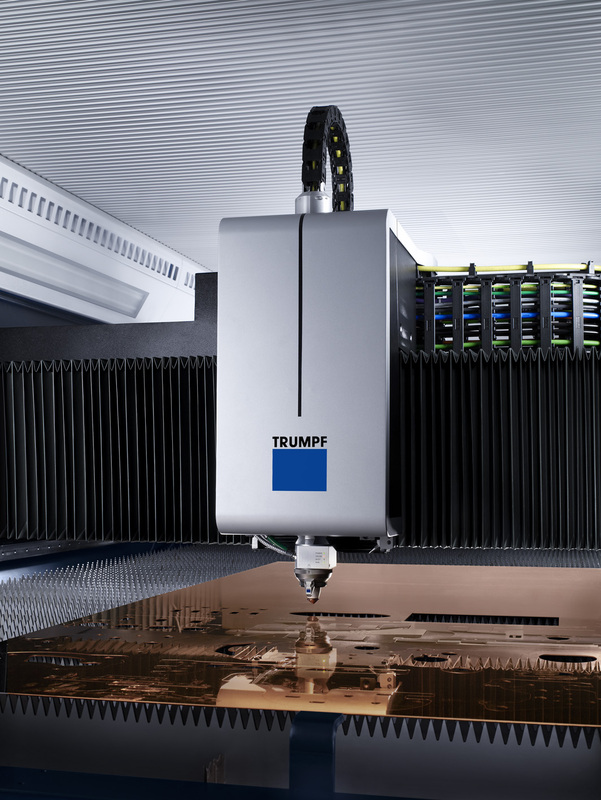 Computer numerically controlled (CNC) laser cutting is a metal cutting production process carried out by laser cutting machines. 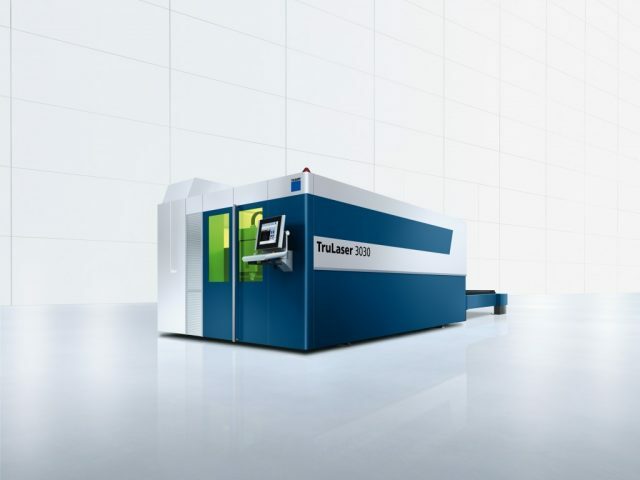 These laser machines can cut a range of ferrous and non-ferrous materials using a laser beam to melt the metal and an assist gas to blast the molten metal from the under surface of the parent metal. 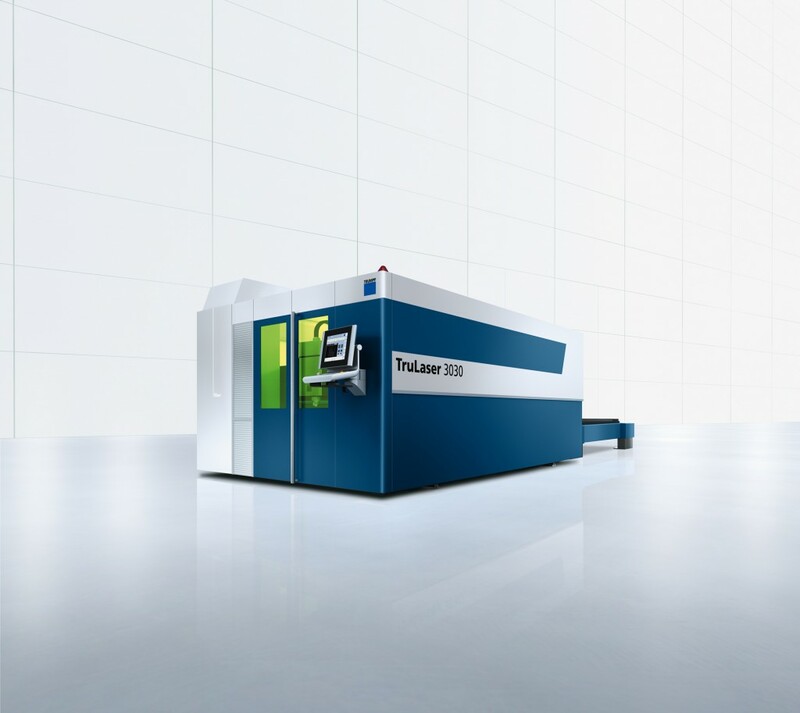 They fall into 2 categories, either CO2 or fibre generated laser cutting systems. 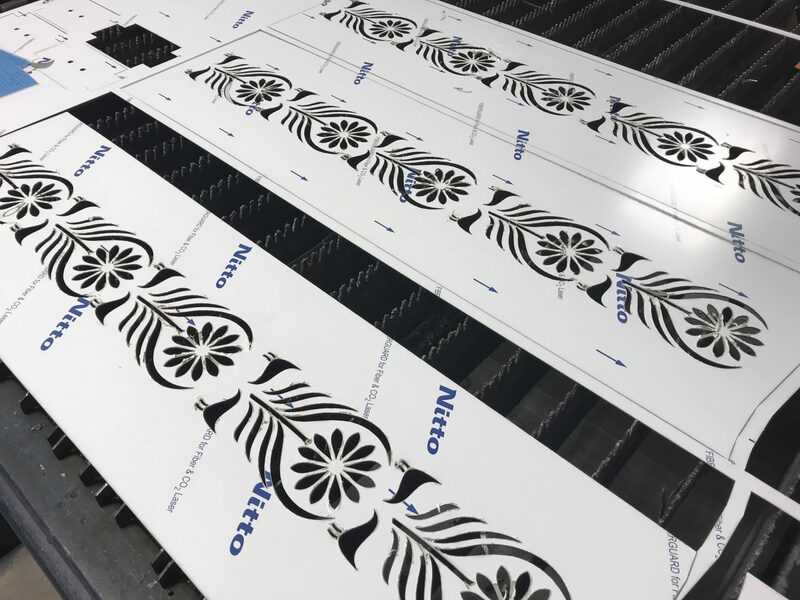 The traditional CO2 laser cutter has been available to sheet metal workshops for many years now and come in a range of physical machine sizes and cutting power ratings. 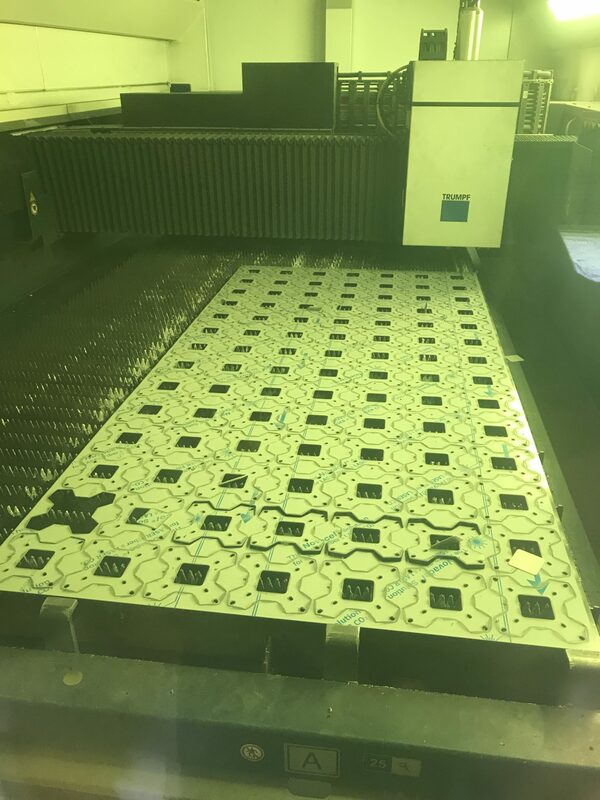 Some larger laser cutting machines can be linked to pallet changing towers holding many different types of metal and can have finished laser cut components removed by robots and scrap carried away by conveyor systems. Most simpler laser systems have a standalone laser cutting machine, 2 sheet pallet changer system and part collection bins. 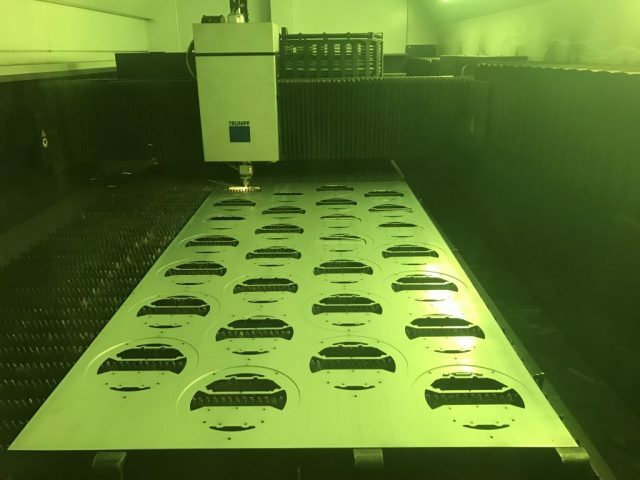 Some CO2 laser systems can even be incorporated into a CNC punch press, normally known as a combination machine enabling both CNC punching and laser cutting processes to be carried out by the same machine in 2 different production cycles. 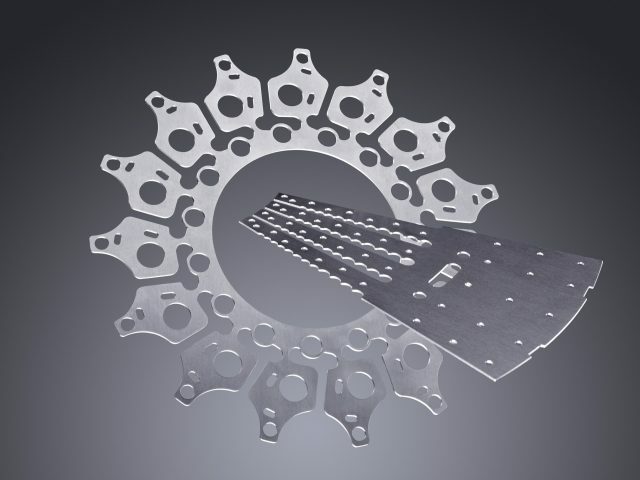 This has the advantage of being able to perhaps CNC punch standard holes very quickly, form in designed features such as dimples or ventilation louvres and then laser cut any irregular cut outs or outer profiles. 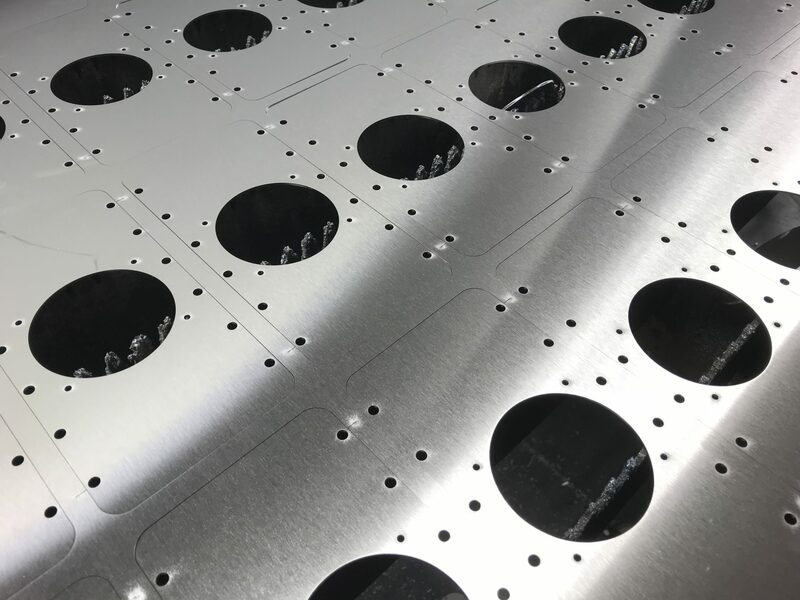 The disadvantage of this cutting system is that the machines are very expensive and you can only CNC punch or laser cut at any one time so you have 2 machines built into one but only one can be cutting at a time. 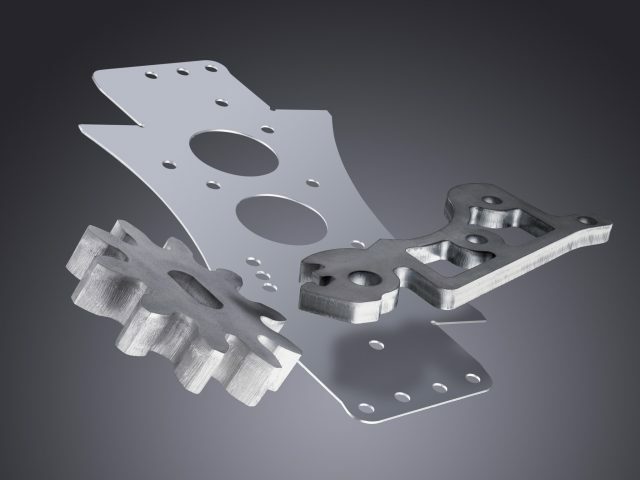 We have got around this problem by having separate CNC punch presses and a CNC laser cutting machine. 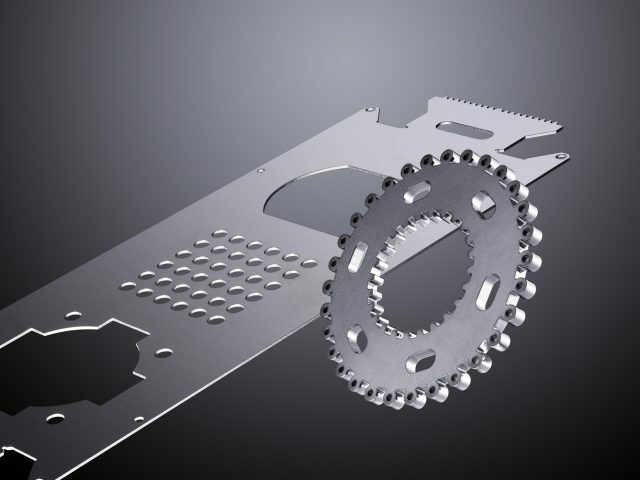 We can then select the most efficient method of cutting for the component design and even pass parts from one cutting machine to another to get the best of both worlds for example, we have a 3mm mild steel sheet metal component we laser cut and then finish off by forming CSK shapes on one of our Trumpf CNC punch presses and this works very well. 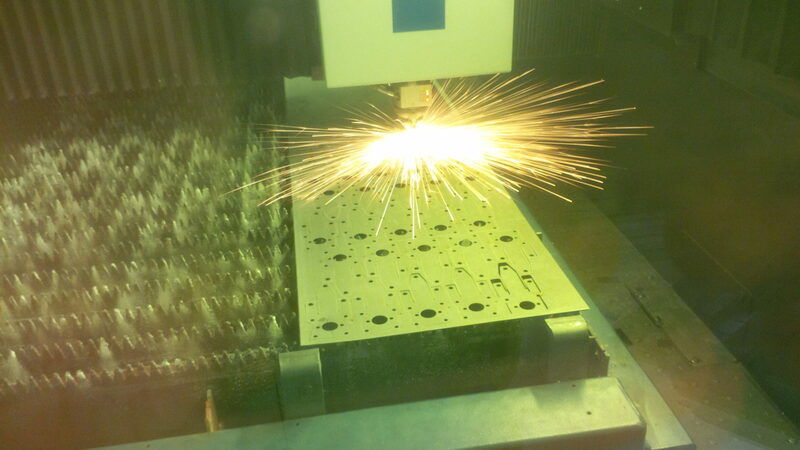 Here we have a 0.9mm thick zintec coated mild steel bracket being laser cut with compressed air at great speed. 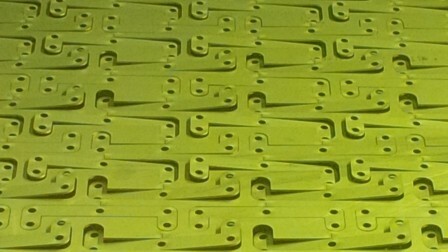 These components were taken straight from the laser cut nest and folded up without any edge deburring required. 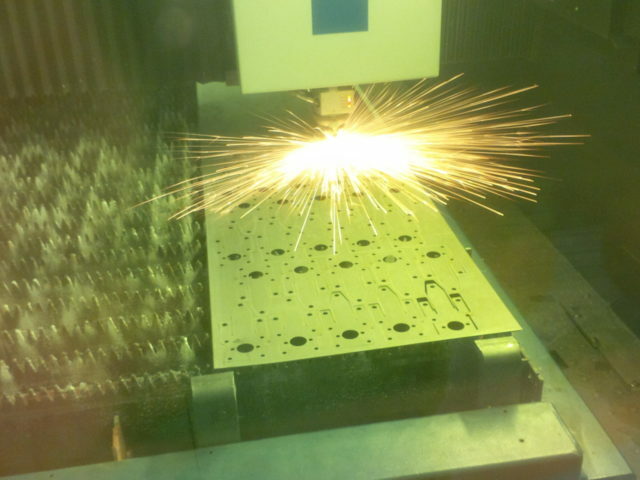 Generating, creating or writing a laser CNC program is the computer aided manufacturing (CAM) aspect of the traditional CAD/CAM cycle. Information about a design may be presented in a paper based format, 2D or 3D file direct from a customer. We can read DXF and DWG files for 2D drawings and SAT or STEP files for 3D models directly into our Radan® sheet metal software. 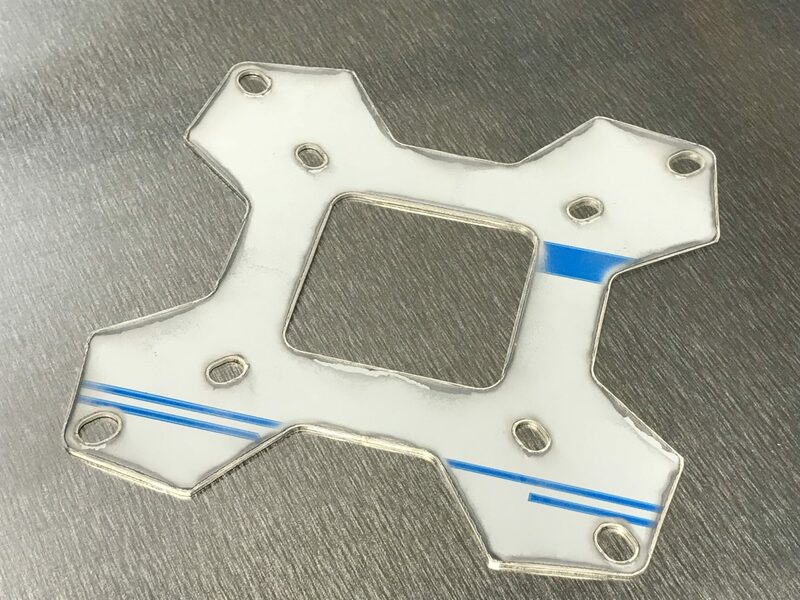 This information is just the start of a process that leads eventually to the finished laser cut metal component. 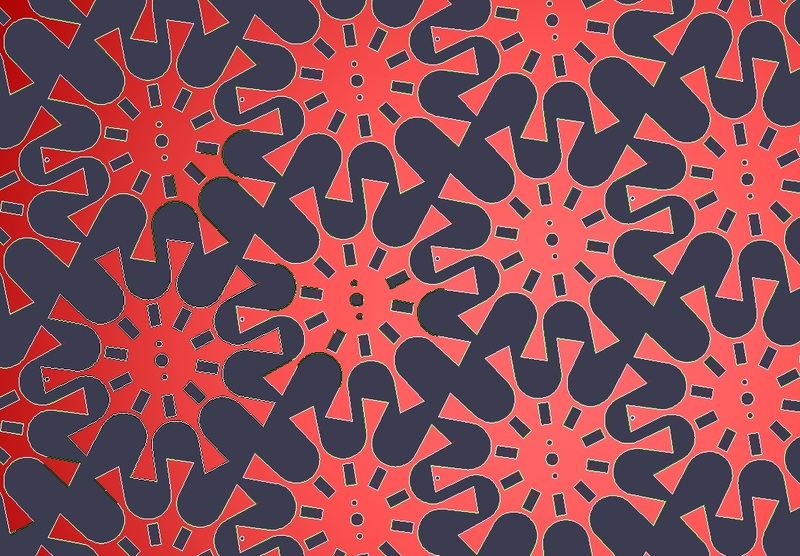 Using 3D modelling within the software enables us to calculate the flat blank size and shape that needs to be laser cut so that when it’s bent up it is an accurate representation of the final component drawn by the design engineer. 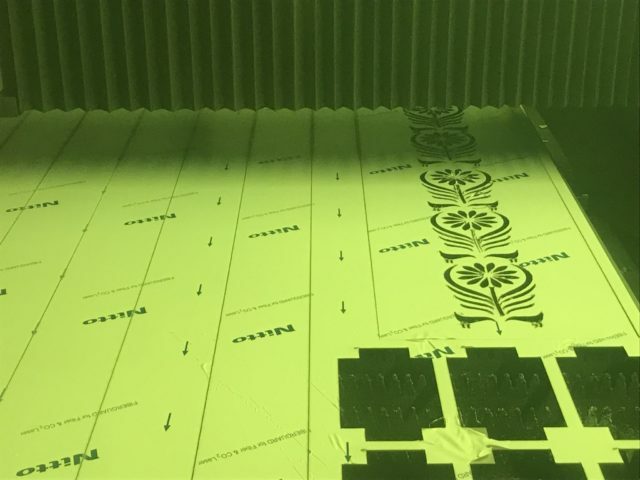 The software can do so much more virtually automatically such as tooling all features with the correct laser profile, cutting lead ins, the best fit of components whether regular profile, irregular or mixed part sheets to produce the cheapest laser parts possible. 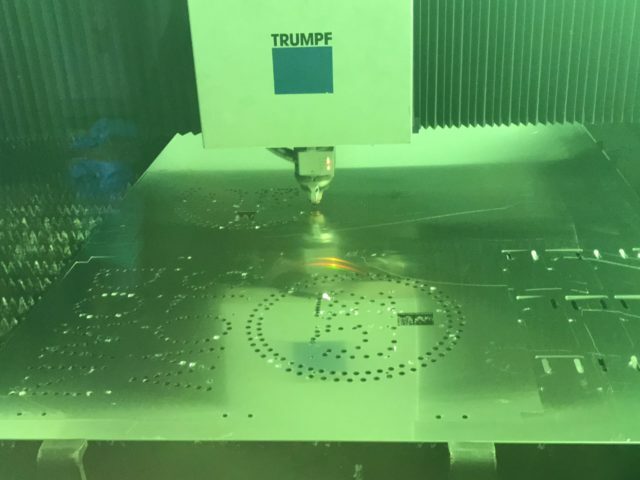 All this is done to generate a compiled code that will instruct the laser cutter to follow a path of cutting with the correct assist gas to produce all the laser parts required to satisfy the customer’s order. 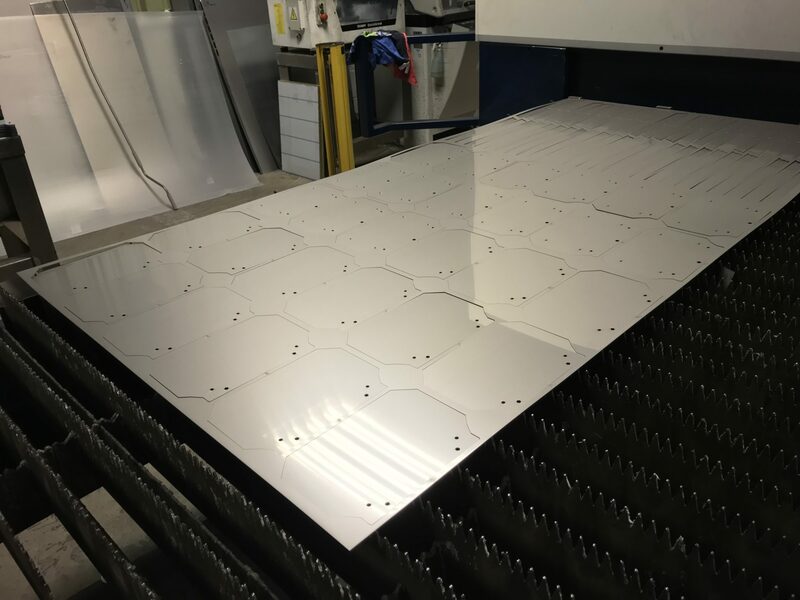 More information on this exciting new development in laser cutting at V and F Sheet Metal please view our gallery pages. 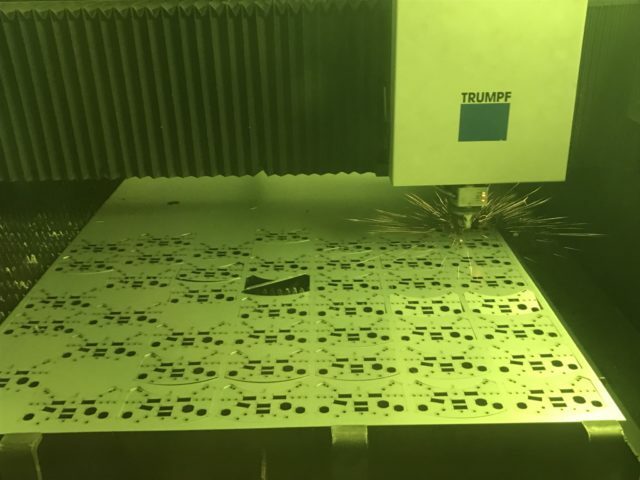 Trumpf 3030 fiber cutting copper sheet metal components. Fibre lasers can cut copper and brass with ease. 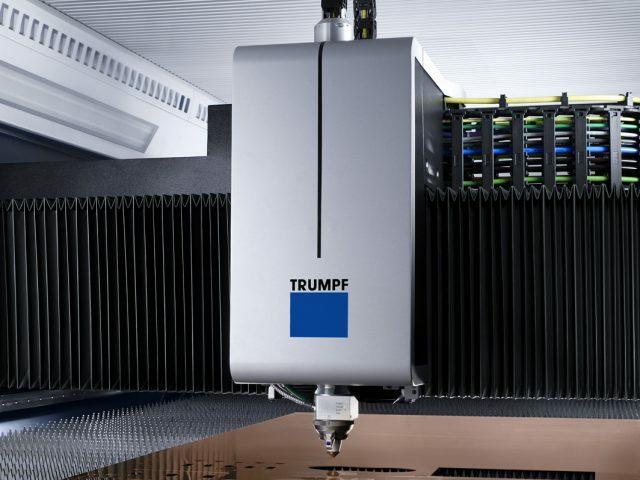 Small range of materials that can easily be laser cut with a Trumpf 3030 3KW fiber laser including ferrous, non-ferrous and yellow metals. 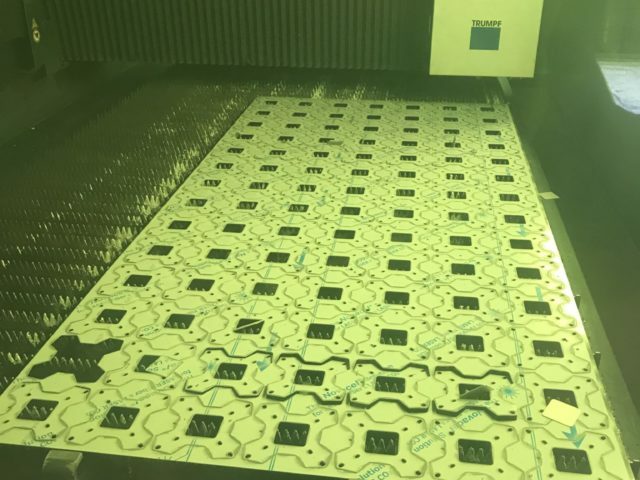 Intricate shapes are no problem for a Trumpf 3030 fiber and when coupled with Radan CAD/CAM software they make the perfect partnership. 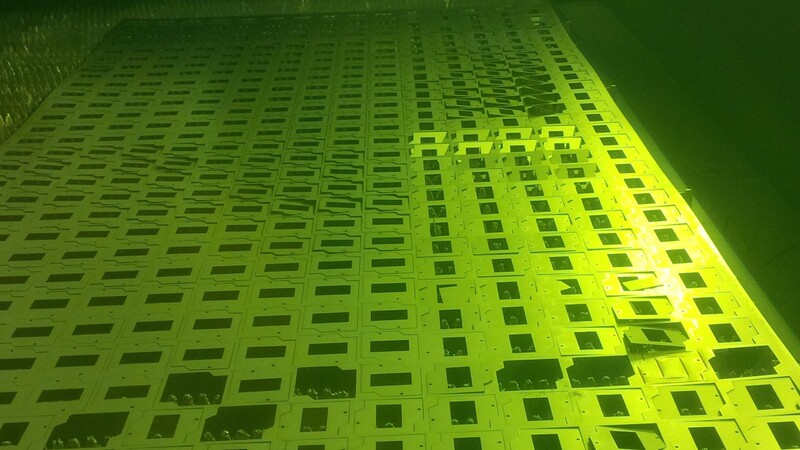 Laser cut sheet metal work inside Trumpf machine enclosure. The green filter is designed to protect the operators eyes from the laser beam light frequencies. 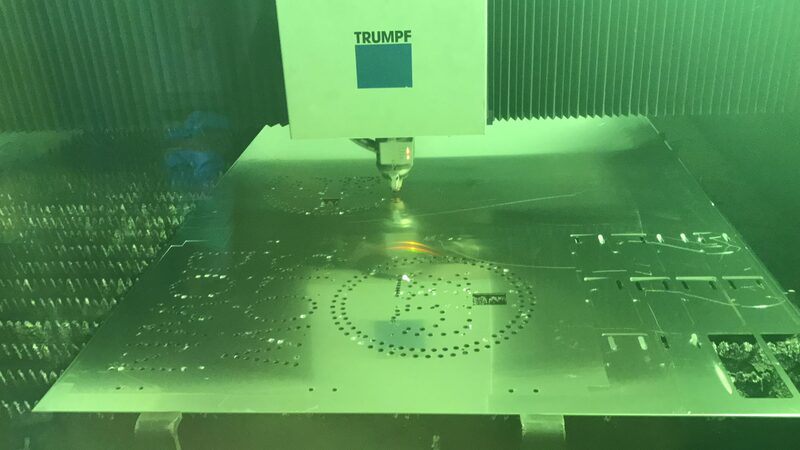 Busy parts with lots of holes and cut-outs are no problem with a Trumpf 3030 fibre laser cutting machine, the full sheet will be utilised. 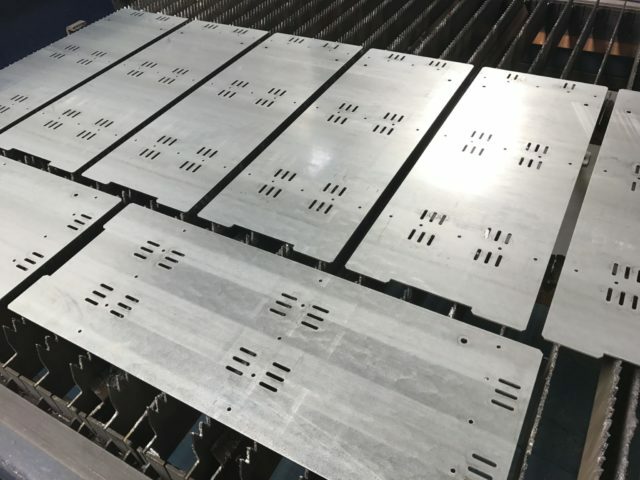 Laser cutting heavy gauge mild steel bracket blanks from an off-cut from a previous job helps to save waste and money in production. 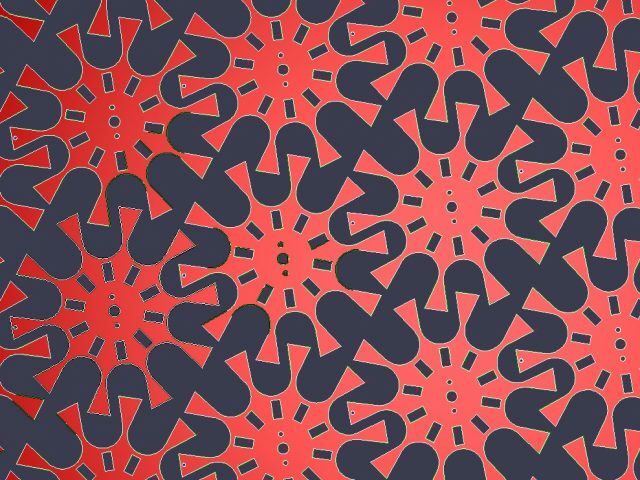 Laser cutting circles is so easy and complex shapes are all produced with no tooling needed and very clean edges. 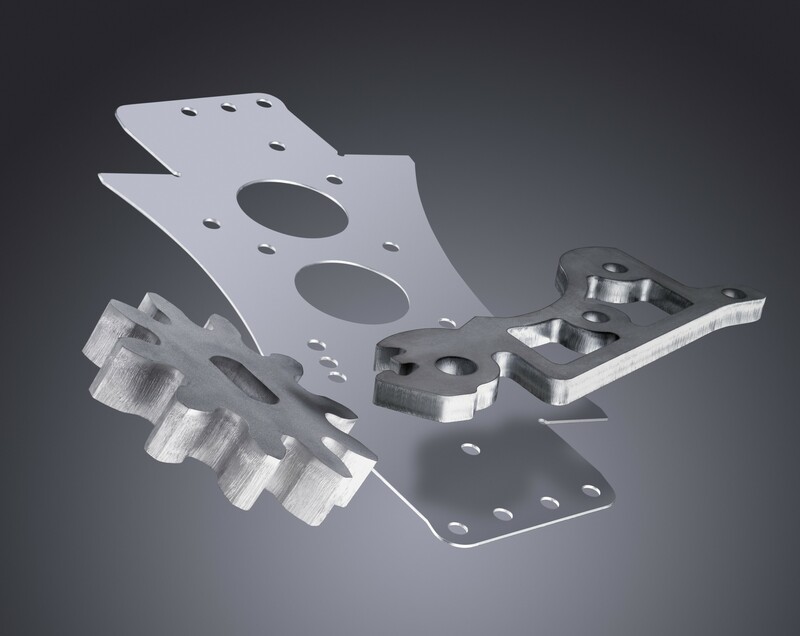 Most thin parts do not need secondary de-burring after laser cutting. 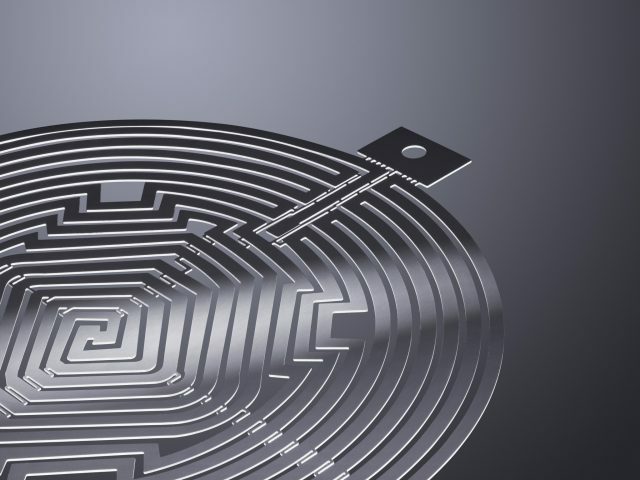 The laser is the perfect production machine for cutting complex decorative patterns in stainless steel. Due to the quick set up times even small batches of work can still be competitively quoted. 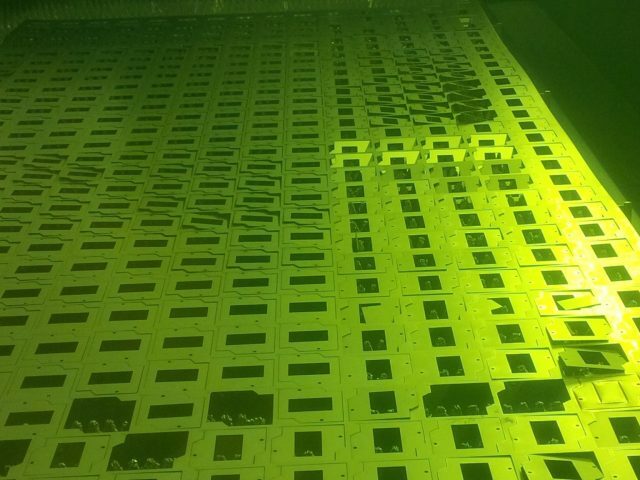 Banks of sheet metal components laser cut in full sheets held in with a single small tag. A small twist and the parts removed from the sheet. 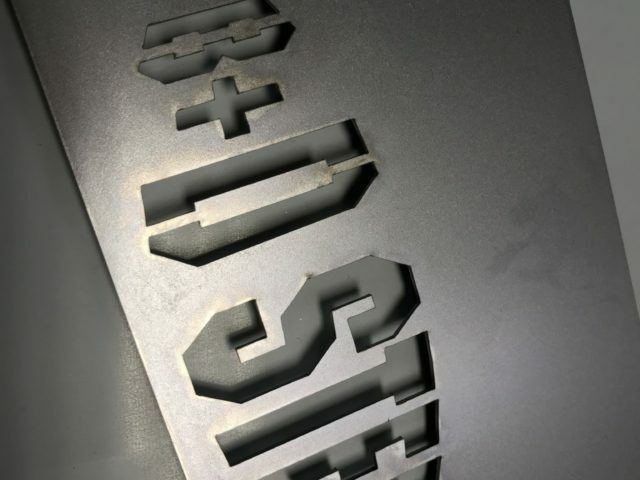 Laser cutting lettering for templates is easy with a laser cutter and the right software to create accurate CNC programs. Laser cutting stainless steel parts cleanly by cutting with pure nitrogen gas. 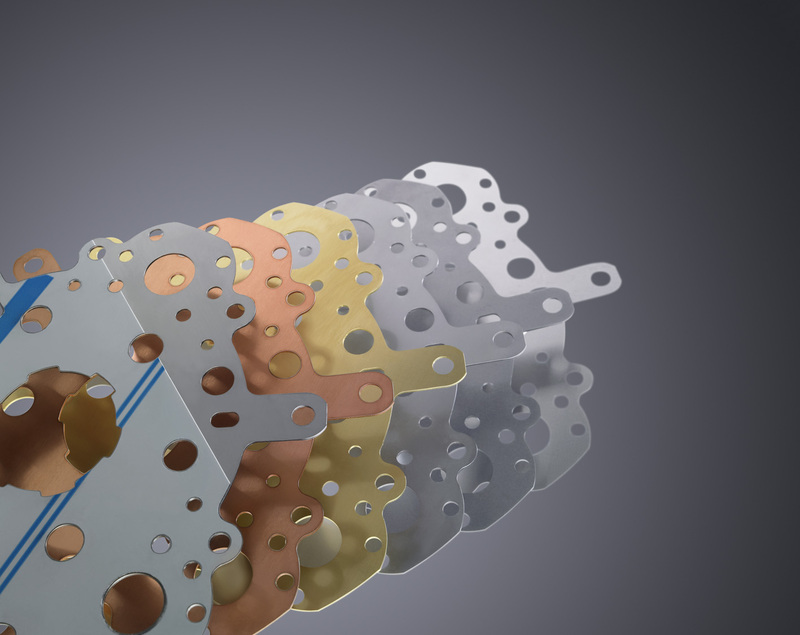 Mixed parts on the same sheet of metal is simple with Radan software and a Trumpf 3030 fibre laser. This makes it easier for the machine operator to produce all the parts needed for a single order in one go. 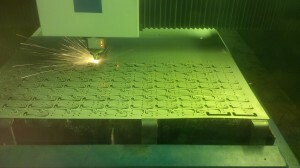 Laser cut 3mm thick zintec panels still on the machine bed after the scrap nest skeleton has been lifted off the bed. Laser cutting speed detector panels produced from 2mm thick 5251 aluminium alloy. a family of parts are cut together for the same job. 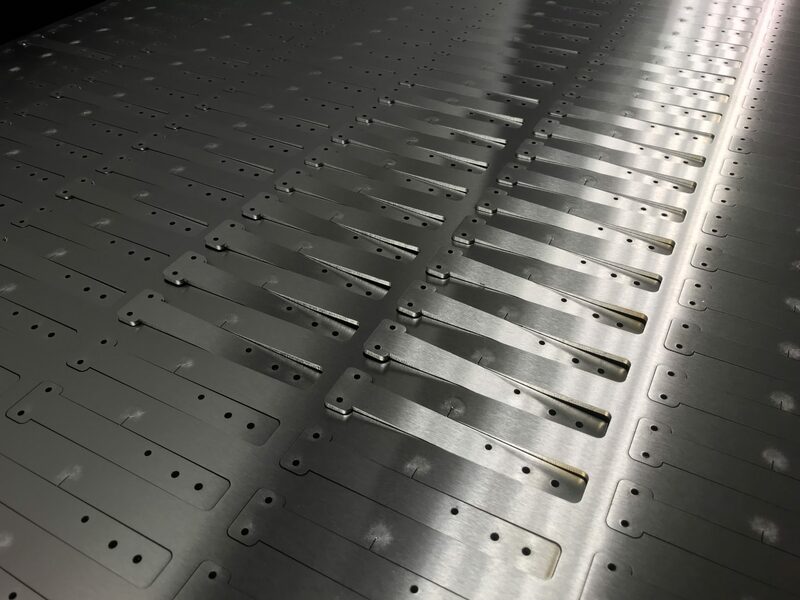 Laser cut stainless steel brackets with a single tag to hold them in the sheet waiting to be removed without the need for de-burring. 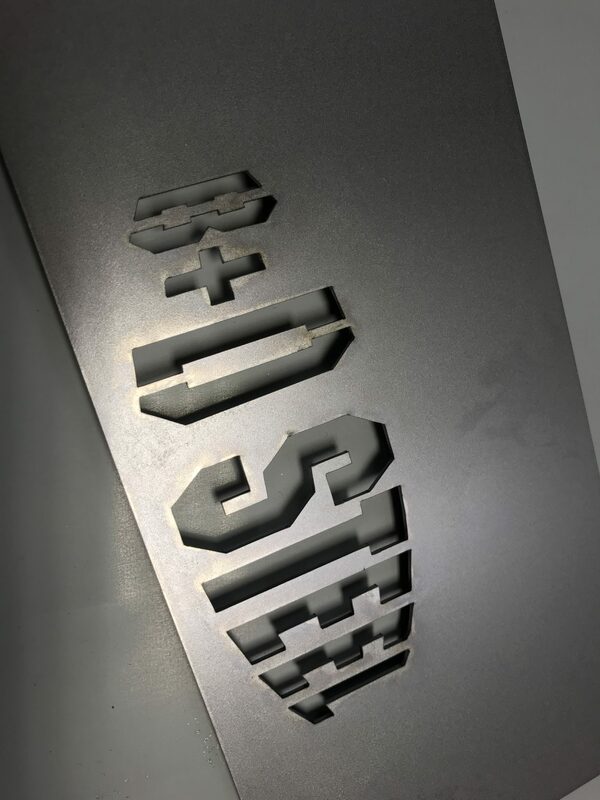 Laser cut stainless steel panels automatically positioned to get the best from a sheet of metal. The operator can remove these parts straight from the cut nest while the laser machine is cutting the next sheet.